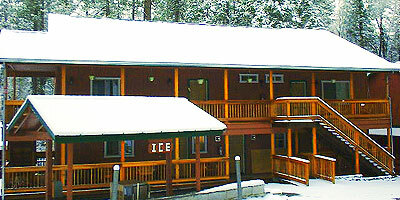 Several hotels near Yosemite National Park may offer cabins and suites but none compare to Yosemite Riverside Inn. Bring the family on an unforgettable vacation in one of our luxury family suites or rustic cabins. 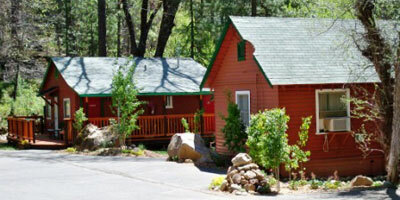 No other hotels near Yosemite National Park offer such accommodating cabins just 10 minutes away from the park. Whether you stay in one of our cabin rentals or suites, you’ll have access to all the features and amenities you’ll need while on your vacation. Your rental cabins include beautiful view of the river as well as full kitchens to accommodate your vacation needs. The suites are spacious making them perfect for large families or groups. Book online to reserve your very own cabin or suite. Prices range from $135-$245 depending on the season with 3, 5, & 7 day discounts available. The Family Suite A has 2 bedrooms, a kitchen, living room, and bathroom. The first bedroom features one king bed, a large flat screen TV with satellite and a DVD/VHS player, and a phone. The 2nd bedroom is located out on an enclosed insulated deck with beautiful views of the trout river and features one queen bed and a small desk with a phone and internet access. 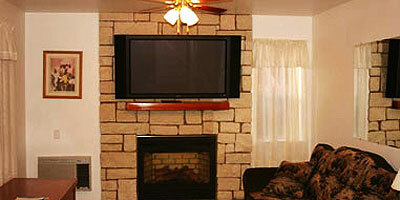 The living room features a sofa, chair, large 50 inch flat screen TV with satellite, and a large gas fireplace. This suite sleeps 4-6 people max and includes a full size bathroom with a tub, a kitchen table with 4 chairs, a fully equipped kitchen with a small range oven, mini refrigerator, toaster, microwave oven, coffee maker, pots, pans, utensils, and all cookware. Like all of the suites, the Family Suite A also includes the entire list of basic suite amenities listed at the top. Price ranges from $235-$340 depending on the season with 3, 5, & 7 day discounts are available. The Family Suite B has 1 bedroom, a living room, kitchen, deck, and bathroom. The bedroom features one queen bed, a TV with satellite and a DVD/VHS player, and a phone. The deck is enclosed and insulated and offers beautiful views of the trout river, and a small desk with internet and phone. The living room features a sofa, chair, gas fireplace, and a 2nd TV with satellite. This suite sleeps 4-6 people max and features a full size bathroom with a tub, a kitchen table with 6 chairs, a very large fully equipped kitchen with a refrigerator, oven, coffee maker, pots, pans, utensils, and all cookware. Like all of the suites, the Family Suite B also includes the entire list of basic suite amenities listed at the top. Price ranges from $235-$335 depending on the season with 3, 5, & 7 day discounts are available. The Executive Suite is our largest suite and has 2 bedrooms, 3 TV’s, and an enclosed insulated deck with a small desk, internet, phone, card table for 4, and beautiful view of the trout stream. The first bedroom has two queen beds, a phone, and a TV with satellite and a DVD/VHS player. The second bedroom has one queen bed and a 2nd TV with satellite. The living room features a sofa, chair, gas fireplace, and the 3rd TV with satellite. This suite sleeps 6-8 people max and features a full bathroom with a tub, a kitchen table with 8 chairs, a fully equipped kitchen with an oven, refrigerator, toaster, microwave, coffee maker, pots, pans, utensils, and all cookware. Like all of the suites, the Executive Suite also includes the entire list of basic suite amenities listed at the top. Price ranges from $265-$355 depending on the season with 3, 5, & 7 day discounts are available. A section of all these suites can be rented as a regular room called our Inner Courtyard Deluxe room making it a regular hotel room at a very cheap rate. The Inner Courtyard Deluxe rooms simply include the 1 bedroom, the bathroom, and a kitchenette. Access to the extra rooms and features are simply restricted. No other hotels near Yosemite National Park offer such a friendly staff and great location. We look forward to your visit with us.